The Verkhovna Rada of Ukraine has accepted the resignation of member of Deputy Prime Minister Valeriy Voschevsky (the Radical Party). A total of 234 parliamentarians voted in favor of accepting his resignation on Thursday, an Interfax-Ukraine has reported. On September 15, lawmakers voted on accepting the resignation of Voschevsky four times, failing to pass the motion on each occasion. 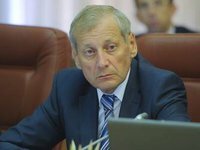 On September 1, Voschevsky said he would resign his position as deputy prime minister for infrastructure in the Arseniy Yatseniuk Cabinet due to the Radical Party's decision to leave the parliamentary collation. "The Radical Party's decision to secede from the coalition has been unanimous… hence; the Radical Party cannot have its representative in the government. This means I will tender my resignation from the position of deputy prime minister," he told reporters.